A liquid complementary feed supplement for poultry and game birds, containing vitamins, chelated trace elements, iron and key minerals. Designed to assist recovery from the symptoms from red mite, including lethargy and anaemia. 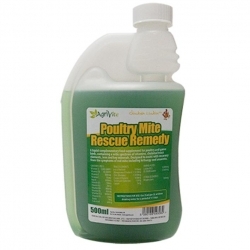 Agrivite poultry mite rescue remedy. Powder Duster for Red Mite & Louse Powder.